Do you have a business in the Toronto? Looking for something to make your store’s front window stand out? At Sarit Arnesty, we’re experts at crafting commercial drapes. We can provide drapery that will be a perfect fit for your business, creating the perfect balance of aesthetics and ambience to draw customers inside and improve the work space for employees. We’ll look at the amount of light coming into the space in which you’re looking to hang your drapes, and talk to you about how exactly you’d like that light to be filtered or blocked. We’ll then use that information to choose the best material for your drapes. If you need drapes for an office space, you may want to allow natural light into the room while stopping it from creating glare on computer screens and making it difficult to see. While you want to invite paying customer to step inside, you also want to ward off unwanted visitors. Outside of opening hours, leaving the window to your commercial property clear for everyone to see through may be dangerous as it leaves you open to the temptation of burglars. Using drapes to cover the window can make your property safer, giving you peace of mind. Another aspect to consider when using drapes to enhance safety is flammability. In the event of a fire, drapes made out of the wrong material can be a huge fire hazard. We’ll help you to select fabrics that are safe as well as beautiful. Dressing your window the right way with beautiful commercial drapery make your business stand out from the competition as well as catching the attention of customers and drawing them into your store. If your store or office is on a busy street, commercial drapery can help you to create a quiet atmosphere to shut out the world outside and allow to you to have intimate conversations with your customers and work in peace. If this is something you’re looking for, we’ll help you to select a material and lining that reduces noise as much as possible. When you’re running a business, it’s important to reduce overheads as much as possible, and heating and air conditioning bills can be a huge contributor to your bills. You can reduce those bills by using the right commercial drapes. At Sarit Arnesty, we know how to craft custom window coverings that help to maintain the perfect temperature in your place of work by keeping heat in during cold weather and blocking out light and heat from the sun on hot days. Beautiful drapery can give the impression of elegance and luxury. When you want to show your customers that you provide great quality before they even step inside, commercial drapes are a great way to achieve this. If you want to transform your store front, drapes could do the trick. We know that when you’re busy running a business, you don’t have time to clean and maintain your drapes the way you might do at home. That’s why we take care to ensure that the drapes we provide for your business require as little cleaning as possible, leaving you to focus on what’s important. Do you want made-to-measure drapes for your business? 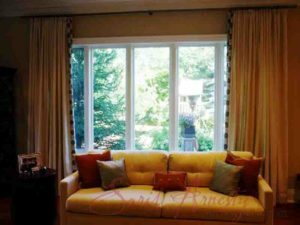 Sarit Arnesty Custom Drapery is one of the premier producers of commercial drapes in the Toronto, and we’re happy to do any job, big or small.